With the winter holidays knocking on our doors, Romanian-Insider.com reviews some of the best places in Romania to spend the winter holidays. 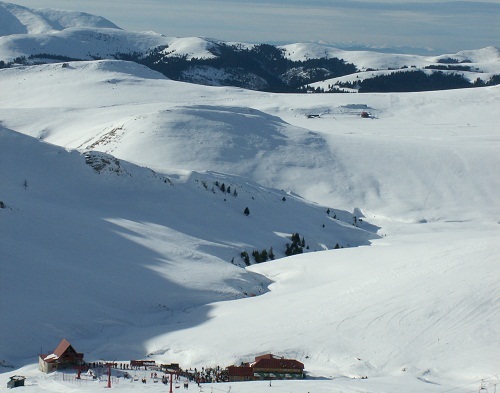 Plus, it adds a useful list of ski slopes in Romania, but before choosing a destination, check the weather forecast, as most of the slopes rely on natural snow. You can choose winter sports, spend some time in the nature, traditional holidays, uncovering less known areas of Romania or taking outdoors baths at low temperatures. Either way, let us know what your favourite places in the country are. Predeal is an easy choice for the tradition seekers. Just two hours away from Bucharest, this destination usually has some of the best Christmas offers. Predeal is located on Prahova Valey, at an altitude of 1110m. As it is an important mountain resort, surrounded by massifs like Postăvarul, Piatra Mare, Bucegi, Baiului. Tourists may enjoy winter sports here -skiing and snowboarding, preferably with a full time professional mountain guide who organizes these kind of winter tours. Iulian Pănescu and Iulian Cozma are two of the professional mountain guides you can choose. More information on these web pages here and here. Shop around for hotel and guest house offers. For example, the three-star hotel Eden Hotel offers a package of RON 800/person for the nights of December 24 and 25, breakfast included, with December 23 and 26 offered for free in the package. Another destination close to Bucharest and a very famous one is Sinaia. 120 km from the capital city, Sinaia has breathtaking views. With altitudes of 850-1000 m and temperatures of -3, -5 degrees in this season, it is one of the finest places for winter fun. Being the oldest touristic resort in Romania, it is very well known and very popular at this time of the year. Those who like to have a lot of people around and exchange multicultural ideas around their cup of hot wine, in a region made for skiing and other winter sports, with very good hotel choices and offers, Sinaia is one of the best choices. Ski slopes and tracks in Sinaia: Vanturis track- for beginners – 2350m; -Piramida track - for beginners- 450 m; Dorului track - for beginners- 600 m; Fata Dorului track- for beginners- 1180 m; Carp track-for advanced skiers- 2500 m; Papagal track-for advanced skiers- 450 m; Turistica track-for advanced skiers- 2800 m.
A similar resort for high altitude Christmas spenders is Poiana Brasov. It has nocturnal lights , ski instructors and funiculars on the ski slope. It can be easily reached by train, car or bus, being quite close to the Romanian capital city. Even if Halloween is long gone and we prepare for another holiday, the Bran Castle is still worth visiting. The scenery there during this time of the year is dreamy-like- that is, if it snows- and one can spend a wonderful white Christmas there. So spending Christmas in neighboring resort Moeciu could be a good idea. The medieval Christmas seekers can also go to Sighisoara, where they can have Christmas in medieval style on the streets of this small gothic town and dine in a medieval restaurant. The Maramures area also awaits visitors. It is quite far from Bucharest but close enough to other important cities which have an international airport such as: Timisoara, Sibiu or Cluj – Napoca. You can also get to this city by car, train or bus. The tourist can stay for around RON 100 /person/night at one of the pensions in the area and go in one of the excursions organized to visit “The Merry Cemetery” - Cimitirul Vesel. The Merry Cemetery is a unique colorful cemetery worth visiting for the dark and humoristic stories written on the tombs and crosses. Far from the the bigger resorts filled with people, there are some unknown Romanian corners which can offer a delightful time during the winter holidays. Padis is located in the West Carpathian chain and has some breathtaking views. One can get there by car or bus from Timisoara or Oradea. Best is to search for organized excursions. Here one can find many unspoiled caves such as Cetatile Ponorolui or the “Cave of Lively Fire” – Pestera Focului Viu, where a huge ice bloc is lighten by the sun rays during the day, giving the illusion that the ice block inside the cave is a big flame of fire. The ice block does not melt during the summer so if one may find it hard to get to it in this season, the wonder will still be available for the traveler’s eye in summer as well. In Padis, a tourist can rent a hotel room for RON 500, with Christmas meal and drinks included. Valea Lotrului – “Lotrului Valey” is another location were natural places are still unspoiled. Here are a lot of protected natural forests like Forest Calinesti, Caldarea Galcescu. Splendid waterfalls like Moara Dracilor - Devil’s Mill”on Galcescu’s downstream and on Latorita de Sus or Apa Spanzurata – “The Hanged Water” on Latorita river are creating a dreamy atmosphere. Many glacial lakes can be also found in this area. The hotel costs are of around RON 250 /person/night but there are a variety of offers. For 5 days, a hotel room with all meals and drinks included cost RON 890 /person with 50% off for children. Valea Lotrului has many spectacular places with natural waterfalls and caves. Tourists can get here by car from Bucharest or even faster from Sibiu or Cluj-Napoca as it is very close to these two cities. Tourists usually come here in groups and rent a whole villa of 18 places for 6 days for the price of around EUR 800. Borsa is another unknown Christmas venue worth discovering. It is an area where three mountains meet: Tibau, Maramuresului and Rodnei. Close by, the natural resort of Pietrosu Mare can be easily reached bycar. Since 1979 this resort has been included in the worldwide network of natural resorts, with Cornu Nedeii – “Nedeea’s Horn”, Salhoi, Piatra Rea – “The Evil Stone” and Izvorul Albastru al Izei – “Iza’s Blue Stream”. Borsa has 5 ski tracks: Olimpic (2.980 m), Poiana Stiol (1.600 m), Puzdrele (1.000 m), Poiana Vf. Stiol (790 m) and Bradet (200 m). Prices at a hotel in these areas are around RON 220/person/night with a traditional Christmas meal included. Straja is a resort in Hunedoara county, in the Valcan mountains, where one can ski – there are eight ski slopes and there is also cable car transport. You can reach the resort from Pietrosani or Targu Jiu, which are aproximately 230 km from Bucharest, going West of Romania. Rau de Mori - “River of Mills” One of the most beautiful views of the Retezat Mountains can be found here. The rivers and their waterfalls are spectacular. Rau de Mori is located in the Hateg Depression and is 4 hours away from the capital city. Around 100 lakes can be found in Retezat Mountains. The most important are Bucura and Zanoaga, of glacial origin. Vatra Dornei is another great spa and ski resort in the north part of Romania, in Suceava County. It is quite far from Bucharest but easily reachable from Iasi or Suceva city- both with airports. With an altitude of 810 m, Vatra Dornei is called the Pearl of Bucovina, in the eastern Carpathian mountains. As this city has a good infrastructure, it connects the eastern with the western part of the country. It has good connections to the railway line from Moldova towards Transylvania, crossing from Suceava to Dej and Cluj. The closest airport is in Suceava. It is surrounded by mountains: Giumalau 1857 m north - east, Suhard 1932, north – west and Calimani 2100 m in south. Ski slopes in Vatra Dornei: Parc – medium – 900 m; Dealul Negru- medium- 3,200 m; Deadlul Runc (Ski fond) – easy – 5,000 m; Poienita – easy- 550 m.
Valea Bistriţei – “The Bistrita Valley” stretches from Vatra Dornei to the reservoir before Bicaz called Poiana Largului. It is one of the most beautiful travel routes in Europe, with its original nature and the distinctive Moldavian villages. In the south - west, the “Bistrita Mountains” - Muntii Bistiţei and north-east it borders the Bucovina. Campulung Moldovenesc is a very good choice for the mountain climbers and adrenaline seekers in this time of the year. Rarau Mountains are well suited for mountain climbing. One can get here from Iasi or Suceava by train. It is located 43 km away from Vatra Dornei, at 211 km between Iasi and Cluj and 113 km from Cernauti. Ski lovers will find a great place here while children can go by sleigh. Several caves can also be visited here. For those who would like to try a different kind of Christmas, at the Baile Herculane – “Herculane Baths”, taking a hot bath while there are minus 10 Celsius degrees outside is actually healthy and interesting. The place is very close to Timisoara and Sibiu and at only 4 hours from Bucharest. You'll be surprised to see that a lot of tourists choose this alternative. Near Miercurea Ciuc, another destination called Harghita Baths is also part of the spa tourism offer in Romania. Many offers can be found on the internet or at the travel agencies as these are two famous Romanian tourist areas. Harghita Baths is at only three hours far from Bucharest and it can be reached by train firstly to Miercurea Ciuc and then by car or bus. Winter sports can also be tried here on one of the seven ski tracks, ranging from 200 to 1000m high with nocturnal lights. There are a lot of houses for rent and hotels in the area with prices raging around RON 300/night.